Barış Manço, born Tosun Yusuf Mehmet Barış Manço, was a Turkish rock singer, composer, and television producer. Manço composed around 200 songs, many of which have been translated into several different languages. He is considered one of the most popular public figures of Turkey, even after his death in 1999. Born in 1943 in Uskudar, Istanbul, Turkey, Manço’s mother, Rikkat Uyanik, was reported to be a famous singer in the early 1940s. His older brother was born during World War II, and his name, Savas, means “war” in Turkish. Baris’ name means “peace” in Turkish. Baris was given this name by his parents to celebrate the end of the war. He was also given the name Tosun Yusuf at birth after his deceased uncle. However, this name was removed just before Baris began primary school. It was in high school that Manço formed his first band, Kafadarlar, which translates to “The Buddies.” Between 1962-1963, Manço formed a new band, Harmoniler (“The Harmonies”). This band recorded cover versions of popular American twist songs and rearrangements of Turkish folk songs in a rock form. This is said to mark the beginning of the Anatolian rock movement, a synthesis of Turkish folk music and rock. It is also said that, at this point in time, Manço’s key musical influence was Elvis Presley. Barış Manço graduated high school in 1963, at which point he moved to Europe, travelling around Paris and Liege, forming bands with local musicians and recording singles that were mainly in English and French, but also Turkish. He toured with his band Les Mistigris until 1967. In 1967, there are reports that suggest Manço suffered a serious car accident, and as a result, he grew out his moustache to hide his scar. Whether this is true or not is unknown. Manço started to become frustrated by the difficulties of working with musicians from different nationalities, so he formed the band Kaygisizlar (“The Carefrees”), featuring Mazhar Alanson and Fuat Guner, both of which would be future members of the band MFO. 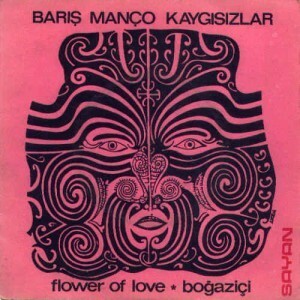 In 1970, Manço formed Baris Manco Ve… and recorded his first hit single, both in Turkey and Belgium, “”Dağlar Dağlar” (Mountains, Mountains!). The song sold over 700,000 copies, and is still one of his most popular pieces.